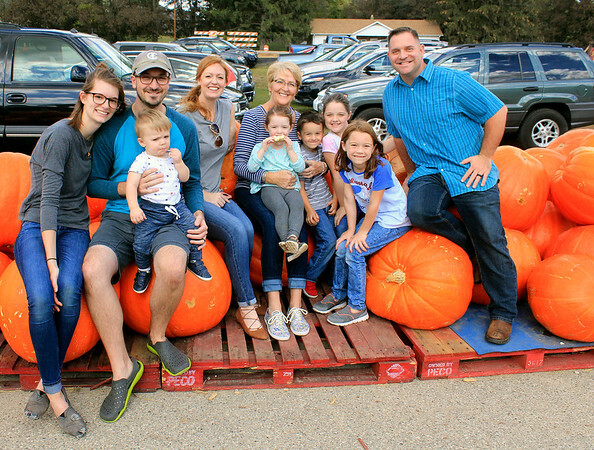 The Weddle and Storer families used some large pumpkins at Kercher's Sunrise Orchard and Farm Market as props as they pose for a family photo Saturday. From left are Esther, Jordan and Micah Weddle, Ashley Store, Julie Weddle and Evelyn, Isaac, Madeline, Molly and Adam Storer. The Weddles are from Goshen and the Storers are formerly of Goshen and now live in Washington, D.C.